What is a Common Multiple and Least Common Multiple? Sometimes terms in math do a pretty good job of describing the thing they name. This is the case with common multiple and least common multiple (LCM). 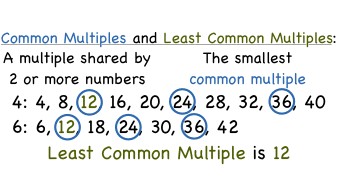 A common multiple is a multiple that two or more numbers have in common. You can probably guess what a least common multiple is! To get more information about these terms, check out this tutorial! Being able to find multiples of a number is important, especially if you want to find the least common multiple (LCM) between numbers. In this tutorial, you'll be introduced to the term multiple. You'll also see how to find multiples of a given number!